Tropical Christmas vacation theme decorations for this tree include Hawaiian shirts, flip flops, surf boards, exotic cocktails, and ornament photo frames (for your tropical vacation and wedding pictures). Add some sea elements that complement this theme, such as coral, seaweed, sand, driftwood, sea glass, seashells, and sand dollars. Here you’ll find decorating tips for reliving your tropical vacation or wedding during the holidays. What type of garland should you choose for this Christmas tree theme? Shell garland or pearl garland makes a beautiful accent to Hawaiian and tropical theme ornaments. 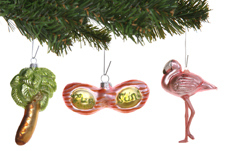 Drape your tree with ribbon in cool beach colors or tropical Hawaiian prints. Silk flower or kukui nut leis can also be used as tropical Christmas garland to accent your tree. The best Christmas light strands for decorating a tropical vacation Christmas tree are white, multicolored, or tropical in theme. Complete this Christmas tree theme with a starfish tree topper. Spread a hula skirt around the bottom of the tree or add a Hawaiian print tree skirt.